TONY Cochrane spends sleepless nights worrying about Gold Coast's critics but says he won't ever give up on the club he staunchly believes can win a premiership one day. Gold Coast's chairman launched a passionate defence of the Suns who have been the subject of ridicule throughout their eight year existence with many questioning their position in the AFL. "Do I get frustrated? Do I get angry? Do I get upset? I'm human, of course I do," Cochrane said on Fox Footy's AFL 360. "I spend sleepless nights worrying about it all. "Forget the Suns for a moment, we have so many juniors on the Gold Coast, what do you say to them? Oh we just gave up after 10 years because we couldn't make it work? "Pigs arse you do. You get in there and you keep pushing and you keep working and you keep toiling until you really do make it work." Cochrane pointed to the club's ability to help the AFL grow participation numbers from around 30,000 a decade ago to 265,760 last year as their biggest success and the reason why the club was so important to the sport. "There will be 265,000 participants registered this year in Queensland," Cochrane said. "That is more than South Australia, the Northern Territory and Tasmania put together. "We are starting at the junior level and it's growing. We only have one big problem in Queensland and that is we have a shortage of ovals. "I can see in another 10-15 years AFL will be so strong and dominant in Queensland and everyone needs to be commended for that." Cochrane conceded the club and the AFL took responsibility for past mistakes in regards to its list and set up, with the Suns battling a retention crisis that has seen their top players including Gary Ablett, Jaeger O'Meara, Dion Prestia, Tom Lynch and Steven May all depart. "Have we the club made mistakes? You bet, absolutely," Cochrane said. Have the AFL made mistakes in setting it up? Absolutely in my opinion. But the only thing you get looking back is a sore neck. "Karmichael Hunt, a million dollars a year, really? There were some bad choices. "I don't think we had the systems in place to be able to deal with so many young people coming to a part of Australia where there wasn't an AFL culture." Cochrane said the club now had the right culture and people, including new coach Stuart Dew he labelled sensational, to move forward towards success. "If I didn't believe that. If I spend one hour of my life not believing that get me out of the job tomorrow," Cochrane said. The AFL currently props up Gold Coast and has tipped millions into the club to ensure its survival and Cochrane believe it would be like that for the first 25 years of its existence. "One of the things the AFL Commission does really well is they have a fantastic long term, what I call Japanese vision," Cochrane, who has tipped his own money into the club, said. "They are prepared to take 25 years to make sure teams like us, the (GWS) Giants, as they did in the case of Sydney and the Lions, all get up and operational. "There is one simple reason for that, the media rights will live and die by the growth of the sport in NSW and Queensland. If you don't believe that than you are in fairy land." 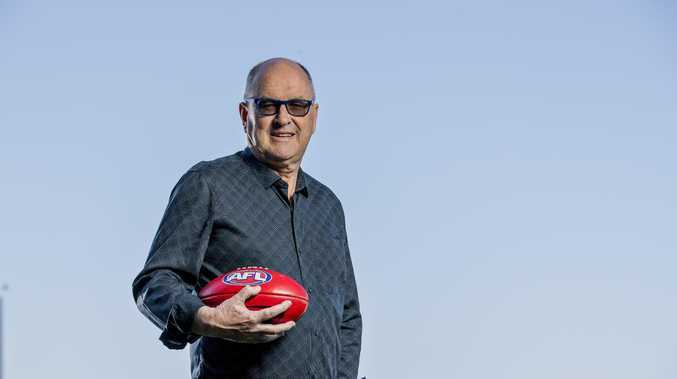 Cochrane, the man who transformed the V8 Supercars into a powerhouse sport, weighed in on the debate surrounding the potential shift of the AFL grand final to a twilight timeslot. "There is no question the AFL grand final will eventually be played in twilight," Cochrane said. "That's what young people want. And you say but the traditionalists. The problem with traditionalists is they die."